Would you pay $35m to live like a cosmonaut for 10 days? They've trained years for this moment — learning complex engineering, subjecting their bodies to bone-rattling simulations, and mentally preparing for the worst. 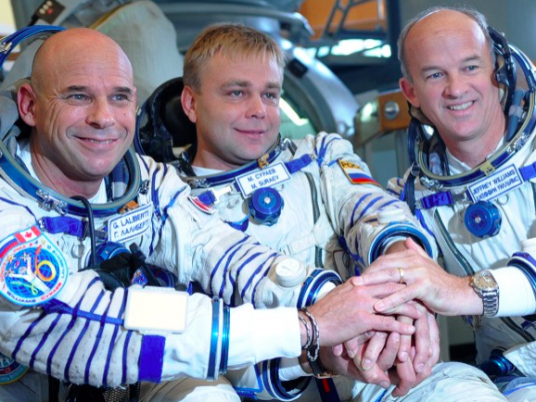 Now in the final hours before blast-off, the trio of cosmonauts must undergo one last rite of passage. A blessing from a Russian Orthodox Priest. Located in the remote steppes of Kazakhstan, Baikonur Cosmodrome occupies a unique space between tradition and cutting edge technology; where awesome rockets continue to launch humans 220 miles above the Earth in much the same way they have done for 50 years. Indeed, this is where Soviet cosmonaut Yuri Gagarin became the first person to fly into space in 1961. And for a mere $35 million you could follow in his galactic footsteps, quite literally blasting off from the very same launchpad. 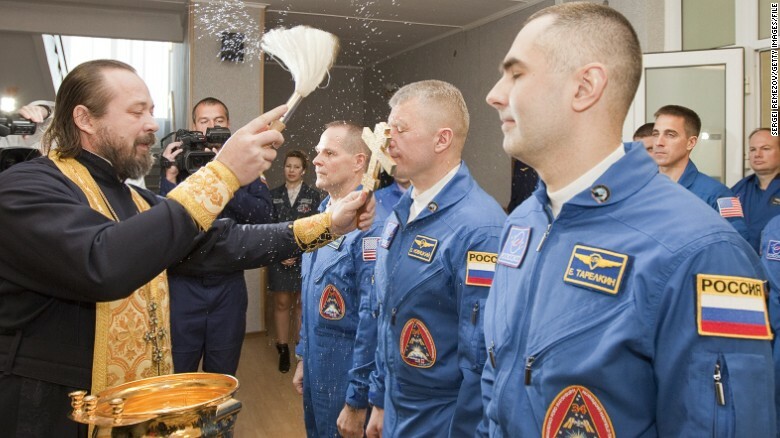 An Orthodox priest blesses the International Space Station crew members — U.S astronaut Kevin Ford and Russian cosmonauts Oleg Novitskiy and Evgeny Tarelkin — before launch. Baikonur is the only place in the world offering space flights for private individuals and so far eight people have taken up the offer since 2001, spending around 10 days on the International Space Station (ISS) with two other trained cosmonauts or astronauts. Before launch, space tourists must complete five months of training spread over a year, mostly at Moscow's Star City, learning everything from the principals of flight to eating in zero-gravity. "They learn how to go about daily life in space — how to prepare food, go to the bathroom, keep themselves clean, and perform scientific experiments when they're on board," explained Tom Shelley, president of Space Adventures, the company arranging private missions into space. "They go through different simulations for launch and zero-gravity, the phases of the mission, and then what do if something goes wrong," he said of the cosmic tourists who are housed in the Russian segment of the ISS. Once at the station, visitors can even venture outside for a space walk — "to look back down on Earth from another perspective can be very emotional," said Shelley — and help conduct scientific research on everything from back pain, to eyesight, and crystal growth. The company's first client was multimillionaire American engineer and investment entrepreneur Dennis Tito, in 2001, who said of the journey: "Before I flew to space, I had no idea how comfortable it would be … I think if a lot of people know what I know now there would be a huge demand." 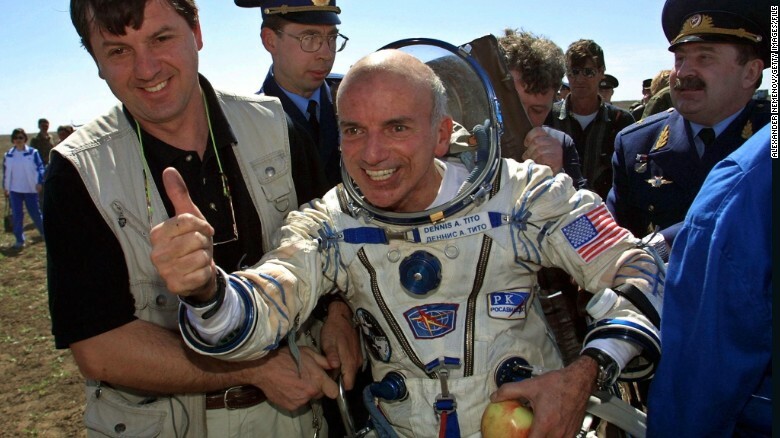 The world's first space tourist, Dennis Tito, celebrates after landing near the Kazakh town of Arkalyk in 2001. Comfort or not, mere mortals unable to stump up the multimillion dollar ticket cost can still watch four manned Soyuz rockets taking off from Baikonur per year — each with three people on board. 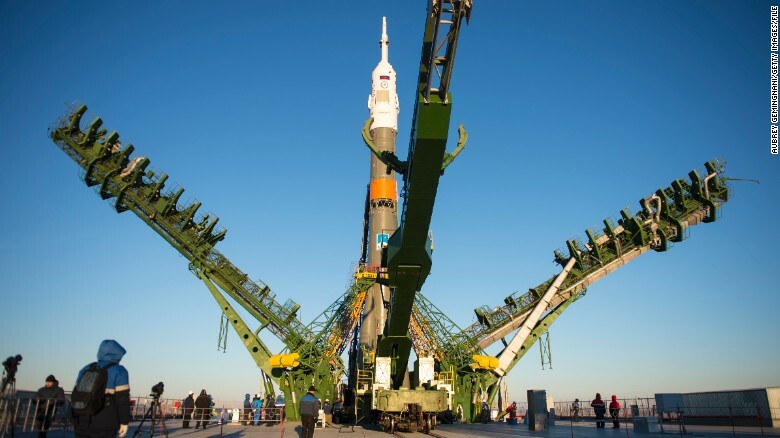 "We're only about a mile away from the launch itself," said Shelley of the $25,000 four-day package, including return flights from Moscow, accommodation, tours of the comosdrome and meet-and-greets with the cosmonauts. "The launch is a spectacular sight, but what is most surprising is the sound and vibrations that you feel through your body. It's just amazing the energy that is being generated." They're not the only operator allowing tourists to get up-close and personal with the Soyuz rocket. Star City Tours offers $4,600 five-day packages, also including return flights to Moscow, accommodation, visit to the International Space School, press conference with the cosmonauts, and of course a viewing of the launch itself. "One of the most spectacular things is seeing the installation of the rocket to the launch site," said Ksenia Nikitonova, project manager of the company which has been visiting the site for over eight years. "Tourists can get several meters from the rocket," she added. "And then we are watching the launch half a kilometer away with the families and friends of the crew." The gantry arms close around the Soyuz TMA-15M spacecraft to secure the rocket before launch. Despite the advanced technology needed to launch into space, there is a certain 1960s aesthetic to Baikonur Cosmodrome; a place which strangely appears frozen in a kind of Soviet time warp, according to Shelley. "It's a 50-year-old-facility and lot of the infrastructure there is very old as it was built in Soviet times, " he said of the cosmodrome which is leased to Russia until 2050. "So it's not as glamorous as some of the U.S. launch sites down in Kennedy Space Center." "It's a strange place to visit — here's this bland landscape, scrubland essentially, flat as the eye can see. And in the middle of it you have these absolutely amazing installations with state-of-the-art technology," he added. "So it's somewhat surreal — you're so far away from the rest of civilization, but here you have something that is really at the cutting edge." A feeling perhaps not so different from being in space itself.